Arlington, Texas. Aug. 31, 2015 — Blue Bridge Financial, LLC, a direct lender and national provider of small business financing, has joined with the National Independent Automobile Dealers Association as NIADA’s latest National Member Benefit partner. Blue Bridge Financial has been an alternative lending source since 2009, offering funding solutions to small businesses nationwide. Through the partnership, the company is offering commercial financing options to NIADA’s 15,000 independent auto dealer members, including vehicle inventory financing for dealers who offer rental, rent-to-own, lease or lease-to-own programs. In additional to vehicle rental and lease funding, programs are also available to NIADA members for equipment purchases, property improvements, service vehicles, shop and office equipment, leasehold improvements, signage and renovations/installations. Working capital loans and financing for general parts, accessory, tire and wheel inventories are offered to cover additional daily expenses and invoices. 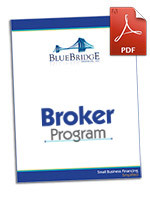 Visit www.bluebridgefinancial.com/NIADA or call (716) 204-8467 for complete financing program details and applications. Blue Bridge Financial, LLC is a direct lender and leading provider of commercial financing solutions for vendors, distributors and small businesses nationally. With fast and easy to obtain funding for equipment purchases, inventory, working capital and special payment programs, they are a complete source for simplified business financing. The company is headquartered in Reston, Virginia, with offices in Buffalo, New York, Tampa, Florida and Lake Wylie, South Carolina. To learn more about Blue Bridge Financial, visit www.bluebridgefinancial.com or call (716) 204-8467. The National Independent Automobile Dealers Association (NIADA) is among the nation’s largest trade associations, representing the used motor vehicle industry comprised of more than 38,000 licensed used car dealers. Since 1946, NIADA has represented the voice and interests of used car dealers at the federal level in Washington D.C. Coupled with its state association network across the country, NIADA’s grass-roots framework provides a dual layer of advocacy unmatched in the used motor vehicle industry. For 69 years, NIADA has engineered programs and leveraged technology to fulfill its mission to advance, educate and promote the independent used car dealer. NIADA members subscribe to a strict Code of Ethics of duty, honor and integrity, and believe in the advancement of small business in support of the free-market system. More information about NIADA programs and educational opportunities is available at www.niada.com, and www.niada.tv.